Minburn United Methodist Church's sanctuary is graced by stained glass windows designed by the late Rev. Robert McBlain, who served Minburn in the 1940's. The wood church built in the early 1900's burned in January 1946, thus a new church was designed, constructed and dedicated by 1949. The hallmark of our sanctuary are the stained glass windows. The following was provided in the 1950 Dedication Services bulletin. The Bible is full of symbolism. Indeed in all religion the use of symbols is very old, for a symbol is simply something which reminds us of something else, often an abstract idea. Thus the symbol calls our minds to remembrance, and in this way is used as an AID TO worship, never as an OBJECT OF worship itself. Those who planned our new church wisely made use of symbols. The Gothic style of architecture in itself is symbolic. The arches pointing upwards –seen in the Nave window, the chancel arch, and even in the ceiling itself – are a reminder of the things above. altar. The center aisle leading to the altar suggests that the way to God is open to all. Eventually a single strip of carpeting leading up to the altar will suggest the unbroken path to God. The open communion rail suggests further that nothing stands between man and his God. The human element – the Christian men and women in the pew, the minister, the choir, the organist – are all placed in a subordinate position. three steps leading to the chancel stand for Trinity. From the lecturn you hear the Word of God being read; you hear laymen reading and speaking. On the other side is the pulpit, and from it those whom God has ordained, preach the Word. The lancet windows in the nave are grouped in threes, symbolizing both the Trinity and the Christian virtues, faith, hope and love. Each group has a common theme, and each window a single symbol. The symbols for our windows were designed by our pastor, Rev. R. A. McBlain. third window honors THE WOMEN’S SOCIETY OF CHRISTIAN SERVICE. 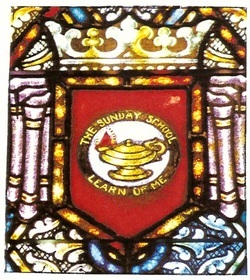 Reproduced in stained glass is their beautiful and meaningful emblem. The middle group of three symbolized THE CHRISTIAN AND HIS WORLD. 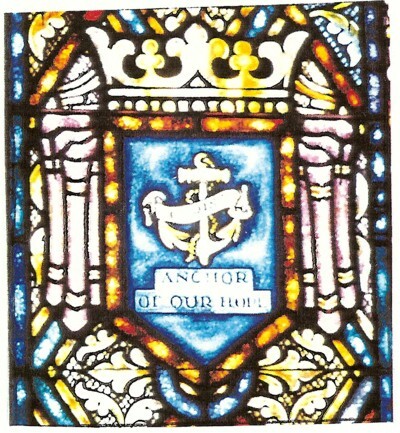 The first window, the CHRISTIAN CITIZENSHIP WINDOW, portrays the Christian and his country by use of the gold cross before an American flag. 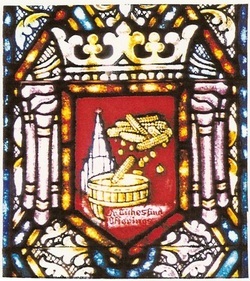 The third, the CHRISTIAN BROTHERHOOD WINDOW, symbolized the Christian and his Fellowmen. The two hands, representing two races, are joined before the cross, the symbol of sacrificial love of Christ. The middle window presents CHRIST as THE WAY. In the foreground are seen the ruins of a war-shattered and sin-torn world. Behind the radiant cross is seen the horizon of a new and better world. Christ is THE WAY. The third of this group symbolized CHRIST, THE ANCHOR OF OUR HOPE. The gold anchor (note the CROSS in the design of the anchor) represents Christ as the Anchor of Our HOPE and of Our FAITH. The trilogy of windows at the rear on the SOUTH side presents NECESSARY AIDS TO THE CHRISTIAN LIFE. The first window shows the open Bible. The tablets of the Ten Commandments representing the Law, and thus the Old Testament, are on the left-hand page. The Radiant Cross of the triumphant Christ on the right-hand page represents the New Testament. 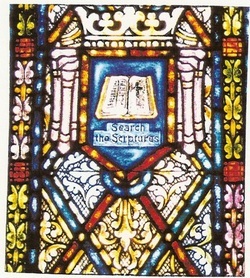 These emphasize the need to “SEARCH THE SCRIPTURES.” The middle window emphasizes the central part of any Christina’s life, PRAYER. 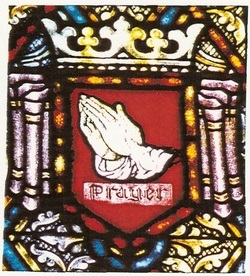 Durer’s famous work “The Praying Hands,”beautifully and worshipfully reproduced in stained glass, reminds us of the necessity of prayerful service in the Christian’s life. The third window emphasizes the social nature of the Christian gospel, and reminds us of the necessity of regular PUBLIC WORSHIP. Our own entrance with its beautiful Bedford stone cross proclaims that worship is important for spiritual vitality. The group closest to the altar is called the WINDOWS OF OUR LORD. In the first, the LAST SUPPER WINDOW, the gold chalice and wafer symbolize the institution of the Lord’s supper on Maundy Thursday by Christ. “This do in remembrance of me.” In the middle, the CRUCIFIXION WINDOW, the cross and the crown of thorns remind us of that day when sacrificial love made it GOOD FRIDAY. 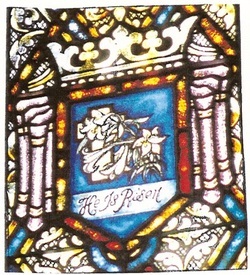 The last window, closest to the altar, proclaims the central message of Christianity: HE IS RISEN. The Easter lily, symbol of resurrection, is combined with the triumphant White EASTER cross to proclaim a Living Lord and Master. The cut cannot hope to do more than suggest the beauty of these windows. Only seen in their colors can one appreciate the inspiring quality of these worshipful windows. The rose window, being a circle, reminds one of the Eternal – no beginning or end. The dossal curtain contains a number of symbols. 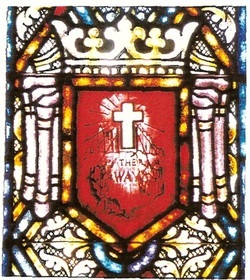 The IH∑ symbol, which is also seen on the altar, on the cross, and even in the window, are the Greek letters for the name JESUS. Also in the dossal curtain are to be seen the Rose of Sharon, the vine, the grapes (the CUP in communion), the Lamb (Pascal Lamb of sacrifice), and the Trifoliate (Trinity). On the face of the altar, in addition to the symbol IHS for the Son of God, who came that men might see and know the nature of God – we have the symbols A and Ω, the first and last letters of the Greek alphabet. These symbolize Christ as the beginning and the end of our Faith (Rev. 1:8).